During a TEDxToronto event on October 26, 2012, Twitter handle @BrendleWhat sent out an inquiry: "Why is the City of Toronto taking bikes from @TedXToronto and throwing them into a furnace? #TedXToronto #BikeFurnace." This single tweet sparked a flood of other similar reports that effectively hijacked the conference's Twitter stream until the organizers reassured everyone that the police were not, in fact, burning bicycles. The #BikeFurnace prank made local news headlines as an unusually sophisticated case of event trolling. It was also an example of an emerging genre of electronic literature that Rob Wittig and Mark Marino have termed netprov, or "networked improv narrative." According to Wittig, netprov is a digital art form "that creates written stories that are networked, collaborative and improvised in real time." Often compared to alternate reality games (ARGs), netprov uses the same strategies of participatory transmedia storytelling but differs through its notable ambivalence to game elements. Instead of puzzles, the focus of netprov is character and narrative development. Netprov also distinguishes itself from earlier forms of electronic literature by its distinctive use of social media as a platform, and most netprov works incorporate real-world events to foster a richer and deeper connection between fiction and reality. Unsuspecting bystanders can thus find themselves straddling several simultaneous realities, experiencing moments of vertigo when they are legitimately unsure as to whether the described occurrences are fact or fiction. As a creative genre founded by scholars of electronic literature and the digital humanities, netprov has emerged as a sociopolitical critique of both its own topical content and the digital networks on which it unfolds, fitting itself comfortably into sites of real-world dialogue. This essay draws on theories of hybrid and x-reality, as well as principles of ethical transmedia design articulated by scholar-practitioners Andrea Phillips, Jaakko Stenros, Markus Montola and Annika Waern, to examine several recent examples of netprov that both coincided with real-world events and were believed to varying degrees and consequences by their audiences. On October 26, 2012, Toronto held its fourth annual TEDx conference at the Sony Centre for Performing Arts. Since many of the speakers were concerned with building a better city for the people, Toronto City Council's recent vote to remove the Jarvis Street bicycle lane was a popular and controversial topic of discussion. Early in the afternoon, Twitter handle @BrendleWhat sent out an inquiry: "Why is the City of Toronto taking bikes from @TedXToronto and throwing them into a furnace? #TedXToronto #BikeFurnace." This single tweet sparked an immediate flood of similar reports from the conference attendees. 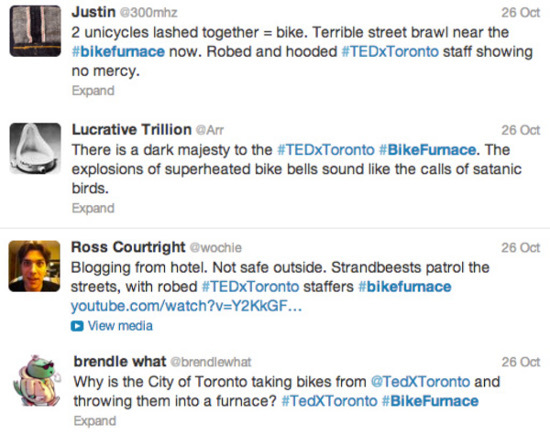 The #BikeFurnance tweets effectively hijacked TEDxToronto's Twitter stream, and those following the incident online were caught in a strange limbo that left them wondering what was happening and why none of the major news networks were reporting the disturbance. As the day progressed and the Twitter story escalated, describing not only missing bikes but also riots, fights and fires without any photographic evidence or local news coverage, it became increasingly clear that the whole thing was a spontaneous fictional response to the Council vote and Mayor Rob Ford's "war on bikes" (Margolis). The TEDxToronto organizers took this strange turn of events in stride and lightly reassured everyone that the police were not, in fact, stealing and burning bicycles. Afterwards, the #BikeFurnace prank made Internet headlines as an unusually sophisticated case of event trolling (Kolberg; Muzychka; Notopoulos). But beyond the act of trolling, it was also an organic, and somewhat accidental, example of an emerging genre of electronic literature that Rob Wittig and Mark Marino have termed netprov, or "networked improv narrative." According to Wittig, netprov is a digital art form "that creates written stories that are networked, collaborative and improvised in real time" ("Networked Improv Narrative" 2). Often compared to alternate reality games (ARGs), netprov uses the same strategies of participatory transmedia storytelling but differs through its notable ambivalence to game elements. Instead of puzzles, the focus of netprov is character and narrative development. Netprov also distinguishes itself from earlier forms of electronic literature by its distinctive use of social media as a platform, and most netprov works incorporate real-world events to foster a richer and deeper connection between fiction and reality. Unsuspecting bystanders can thus find themselves straddling several simultaneous realities, experiencing moments of vertigo when they are legitimately unsure as to whether the described occurrences are fact or fiction. As a creative genre founded by scholars of electronic literature and the digital humanities, netprov has emerged as a sociopolitical critique of both its own topical content and the digital networks on which it unfolds, fitting itself comfortably into sites of real-world dialogue. This essay draws on theories of hybrid and x-reality, as well as principles of ethical transmedia design articulated by scholar-practitioners Andrea Phillips, Jaakko Stenros, Markus Montola and Annika Waern, to examine several recent examples of netprov that both coincided with real-world events and were believed to varying degrees and consequences by their audiences. But first, I return to October 30, 1938, that fateful day in history when CBS Radio announced a Martian invasion. On the day that Orson Welles' War of the Worlds program was first broadcast over American airwaves, it famously sparked a mass panic across the country . This broadcast was one of the earliest uses of transmedia storytelling. Welles took over CBS's regularly scheduled programming for this Halloween special and began with a short introduction informing listeners that this was a fictional adaptation of H.G. Wells' The War of the Worlds. If listeners missed this crucial announcement and tuned in just a few minutes later, they would have heard startling reports from supposed astronomers, professors, journalists, police, politicians and other authorities about a meteor crash and alien invasion (Cruz). What distinguished The War of the Worlds from the popular radio serials of its time was that it made self-conscious use of the broadcast medium, treating the alien invasion as breaking news on CBS. Commercial breaks were omitted to preserve a sense of realism, and related content aired simultaneously on other stations (ibid.). Being the first broadcast of its kind, The War of the Worlds caused a much greater panic than expected, and the public was rightfully outraged by such an elaborate hoax. 75 years after Welles's pioneering production, writers are now using YouTube, Twitter, Facebook, and other dominant means of online communication as the platforms for pervasive fiction. Works of netprov, like The War of the Worlds before them, rise above the level of mere hoax to explore rich narrative possibilities on the same communication channels that people use to talk about real things happening in their lives and around the world. Netprov is experienced in real-time as an interactive performance, and can often be revisited postmortem as a digital archive. The genre is especially collaborative, owing to its origins in theatrical improvisation and, of course, online role-playing games. In many cases, a core group of writer-actors take on the roles of the main characters, each with their own backstory and explicit part to play in the narrative. Readers have the option to follow along silently, but since netprov takes place on the social networking sites that they already frequent in their day-to-day lives, these projects openly and intuitively invite readers to play along. They can create their own characters, or even participate as themselves, and become a part of the story, interacting with the core characters and influencing the chain of events. Perhaps unsurprisingly, Twitter has become the medium's most commonly used platform. The microblogging service already lends itself well to real-time citizen journalism, as proven by its central role in incidents such as the Arab Spring or the 2010 earthquake in Haiti. Disparate conversations can be linked through the use of coordinated hashtags, keywords designated by a hash symbol (#). In North America, Twitter has played a significant role in the Occupy, Idle No More and Casseroles movements, and has become an almost immediate fount of both true and false breaking news. It makes sense, then, that a politically driven netprov, like the TEDxToronto #BikeFurnace, would use the same channels of communication and reach out to engage with real people. Since the Internet has gone mobile, now accessed more frequently from the devices that live in our pockets than those on our office desks (Pew Internet), there has been a noticeable surge in real-time, networked communication that situates itself in the hybrid space between the physical and virtual worlds. In a 2006 article written notably before the release of the first iPhone, Adriana de Souza e Silva characterizes hybrid spaces as connected, mobile, but also fundamentally social: "Hybrid spaces merge the physical and the digital in a social environment created by the mobility of users connected via mobile technology devices" (263). For de Souza e Silva, the current default state of being "always connected" refers not only to an Internet connection, but a more significant social one. It is no coincidence that social networking sites and applications have driven the widespread adoption of smartphones, especially by young people. But as important as this recognition of a newly formed hybrid space might be to our networked culture, de Souza e Silva's work focuses largely on how physical space is made hybrid by mobile media. She all but ignores the opposite effect: how virtual space is made that much more tangible by mobile devices. Beth Coleman's 2011 book, Hello Avatar: Rise of the Networked Generation, examines both sides of the physical/virtual divide and coins the term "x-reality," which she describes as "a continuum of exchanges between virtual and real spaces [in] a world that is no longer either virtual or real but representative of a diversity of network combinations" (3-4). X-reality is not just a physical space overlaid with virtual data, but a fluid state of everyday existence that goes beyond the hybrid spaces described by de Souza e Silva to incorporate social, mobile, and networked media at every level of experience. 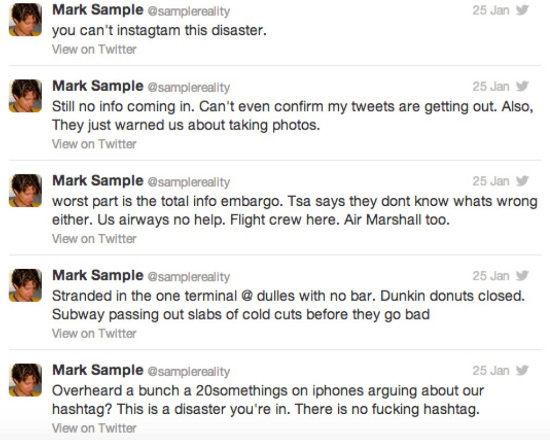 To anyone skimming Sample's Twitter feed without context, they might have interpreted his situation as a real disaster. There had been a massive snowstorm on the east coast that day, leading to many corroborative reports of flight cancellations at Dulles and surrounding airports. Considering the state of American airport security, Sample's horror story was not entirely unbelievable. His friends and followers shared their sympathy, concern and best wishes for him to make it home safely. The saga continued for several days, growing ever wilder and more hallucinatory, and even introducing rumours of zombies. Eventually most of his Twitter followers came to realize that the entire chain of events was Sample's own bold experiment with netprov. But then, on January 29, with no explanation other than the disastrous fiction he had created, @samplereality disappeared from Twitter for almost a month. This already elaborate netprov, performed entirely from a well-known and respected academic's professional Twitter account, soon spawned impersonators who wanted to fill Sample's shoes and continue the story until he came back from his hiatus. When he returned in late February, Sample was troubled by his newfound doppelgängers and went to great lengths to have them deleted from Twitter. The netprov had moved beyond his control and gained a life of its own. The only problem, of course, was that the life it had gained was Mark Sample's online identity. None of the impersonators had meant him any harm in creating these fictitious accounts, and yet he experienced their own performances as a very real invasion upon his personal privacy and space. Netprovs, along with other forms of pervasive media such as alternate reality games, exist perpetually in this liminal "x-reality" state between real and virtual. As demonstrated by both the #BikeFurnace incident and Sample's apocalyptic airport scenario, netprov works can have the same collateral impact as ARGs in alienating and misleading unsuspecting bystanders who do not immediately recognize the fictional status of the social media content. One of the most controversial examples of netprov's potential for bystander deception is Marino and Wittig's Occupy MLA, which began in November of 2011 with the launch of the @OccupyMLA Twitter account and affiliated #omla hashtag . This new faction of the Occupy movement and its three leaders infiltrated the MLA convention in both 2012 and 2013, speaking out against the exploitation of non-tenure track academics and staging tongue-in-cheek events like "International Hug an Adjunct Day." The movement attracted the interest of many vocal supporters and doubters, but none of the occupiers ever made themselves known in person — until Marino and Wittig held a "performance" of Occupy MLA at an electronic literature reading near the end of MLA 2013, finally disclosing its fictional status. Unlike the authors' previous projects, Occupy MLA had not asked reader-players to create and participate in the netprov as fictional characters, but instead engaged with readers as themselves in the discussion of concrete issues facing contingent faculty and graduate students. MLA attendees and Twitter followers were led to believe they were conversing with dedicated activists, not their satirical approximations. While some people suspected that the Occupy MLA movement and its most vocal proponents might be fictional, it was not until the official reveal that anyone knew for certain. Many who had participated, either by taking sides on Twitter or showing their support in person, felt betrayed in the end . However, the movement's ultimate fictionality does not counteract the important political statement that it made, nor the productive conversation that it fueled. Satirical fiction has a long history of creating sites for critical dialogue that might otherwise be too restrictive, and, as Wittig explains, netprov gives readers the opportunity to "play and go deep within a shared narrative, both psychologically and politically ("Pasts and Futures"). But there is yet an ethical issue that needs to be unravelled in the case of Occupy MLA, in that nearly everyone involved was a potentially credulous bystander. Except for Wittig and Marino, none of the participants in the Occupy MLA netprov were operating as reader-players from the inside. On the subject of transmedia ethics, Jaakko Stenros, Markus Montola and Annika Waern discuss bystander involvement in some detail. They state: "A society subscribing to the principle of freedom of expression cannot provide people with protection against being offended, as decency and manners are always matters of personal taste. Instead of considering whether a pervasive game is offensive, the relevant question is whether it is harmful or merely a nuisance to someone" (205). Stenros, Montola and Waern take a radically permissive stand in the case of explicitly political works. They claim that "if a pervasive game is aimed at improving the social system, it should be tolerated even if it might be offensive," for "in the spirit of free speech, the benefit of society demands tolerance of such expressions (209). In Wittig's MA thesis that established netprov as a critical and artistic practice, he modifies Bernard Suits's 1978 definition of a game as "the voluntary attempt to overcome unnecessary obstacles" to posit that netprov is "the voluntary attempt to heal necessary relationships" ("Networked" 34). Netprov is inherently political and interpersonal, and it allows for a collectively fictionalized meditation on a shared sociopolitical premise. Reflecting on the outcomes of Occupy MLA, Leonardo Flores considers the question: "So what did this netprov occupy? A hashtag, which is not to be underestimated because it is an important portion of the MLA conversation...To occupy the MLA hashtag is to gain access to one of the most prized plots of psychic real estate in the humanities" (n. pag). In 2012, I was part of the design team for an ARG that was unintentionally similar to Occupy MLA in that we "occupied" one of the largest North American academic conferences and hijacked its official hashtag. Bonfire of the Humanities was a collaboration between members of the University of Waterloo Games Institute and Drama Department, created for the 2012 Congress of the Humanities and Social Sciences in Waterloo. With thousands of participants representing over 70 different academic associations, Congress is widely considered the Canadian equivalent of the MLA convention. But instead of approaching Congress from the Occupy standpoint, we took a somewhat opposite route to a parallel destination with the creation of a fictional neo-conservative youth group called the Torch Institute. Over the course of the conference, the Torch Institute would stage a protest campaign against government funding for the arts, aptly called "Bonfire of the Humanities" . In addition to the heavily satirical website created by Torch content creator Luke LeBrun, we built up an extensive social media presence over the two months leading up to our May 25 launch date. The Torch Institute had official Twitter, Facebook, YouTube and even Google+ accounts, and each of our eight undergraduate actors created various social media profiles for their characters . Through these outlets, we engaged in political dialogue with actual politicians and journalists, and reported on issues ranging from abortion and gay rights to a student protest movement in Montreal. We wanted the Torch Institute to appear larger than a petty vendetta against Congress, but we also hoped that our comical angle would reduce its believability. As the ARG developed, most of our energy and resources went into the development of the Torch Institute and its characters. The characters became the main focus, and the game elements ended up being cast into a secondary role, often leading to debates amongst our team about whether the dominance of theatrical events would leave enough for our amateur players to do. An important fact I have not yet mentioned is that Bonfire of the Humanities never actually happened. Approximately one week before Congress, we received word that both the Royal Canadian Mounted Police and our own campus police had been monitoring our netprov activities on Twitter. This should not have taken us by surprise; we had been actively courting attention for over a month through the use of the official #Congress2012 hashtag. Needless to say, we were uncomfortably shocked at the extent of our success. We had informed our university administration and the Congress organizers of our intentions well in advance of this incident, and until now they had been quite supportive. At this point, however, they began to express concerns. They claimed that the Torch Institute could be misconstrued by conference attendees as a serious terrorist threat. We were strongly advised to remove any web content that could possibly be misinterpreted, notably the references to book-burning and bonfires, and to cease tweeting on the subject of Congress. In addition, both the administration and conference organizers were anxious about the safety of staged live events, especially with the coinciding escalation of the Casseroles student protests in Montreal. 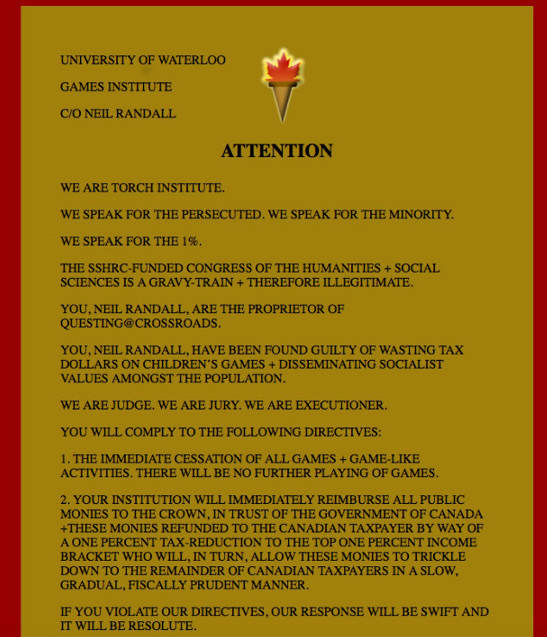 From our perspective, the situation was under control, that is until we received an email from Games Institute Director Neil Randall at 10:30 p.m. the night before launch, informing us that the Torch Institute portion of our ARG had been "shut down" by the Congress organizers. We had been given permission to continue with whatever might remain of our game once we had purged it of its narrative content, but there was little left to salvage even if we had wanted to do so. All that remained was the elaborate netprov we had created. After the shutdown, many of our friends, colleagues, and Twitter followers refused to believe it had actually happened and instead assumed it was just another layer of the narrative in keeping with ARG conventions. Despite the cancellation of the larger game, our netprov continued throughout Congress. The Torch Institute had gained new momentum from the cancellation and would not be silenced easily. From his home in Ottawa, Luke actively live-tweeted our panel at the Canadian Game Studies Association through the Torch Institute' s Twitter account. His virtual presence responded to questions and comments in character as the head of our otherwise faceless organization. Unfortunately, there was nothing "alternate" about the reality of our situation in the end. The actual course of events came uncannily close to the fiction we had premediated in our netprov, and the Torch Institute's "cease and desist" message to The Games Institute ultimately became our lived reality: "YOU WILL COMPLY TO THE FOLLOWING [DIRECTIVE]: ... THE IMMEDIATE CESSATION OF ALL GAMES + GAME-LIKE ACTIVITIES. THERE WILL BE NO FURTHER PLAYING OF GAMES." From the moment of our cancellation, the line between alternate reality and actual reality became disturbingly arbitrary. X-reality became our default state. In a 2011 keynote at South by Southwest, transmedia designer Andrea Phillips publicly denounced the " This Is Not A Game" aesthetic that characterizes most alternate reality games and other transmedia as no longer productive or innovative, creating more potential for harm than any authentic alternate reality experience is actually worth. I believe, however, that this aesthetic can continue be productive in the case of explicitly political ARGs, and that the most powerful netprovs are those that deny their own fictionality. But as I have sought to demonstrate with every example cited thus far, from the simple #BikeFurnace hashtag to Bonfire of the Humanities, there is always a very real risk involved. We are already living in the x-reality that Coleman describes, even without the deliberate blending of fact and fiction that characterizes pervasive fiction, and yet, in many ways, this is exactly what makes netprov so compelling. The stories we choose to enact through social media reflect the specific narrative affordances of the communication channels of our time. Netprov, more than any other media genre, illustrates the increasingly arbitrary distinction between our contemporary communications technologies and media of cultural representation. And it provides a venue for us to run scenarios, to speculate on premises, to "play and go deeper," using the very same platforms on which we struggle through predominant social issues affecting our everyday lives. Aardse, Kent, Lauren Burr, Michael Hancock, and Andrew Houston. " Gaming with the Spectacle of Community in Bonfire of the Humanities." Forthcoming in Digital Studies / Le champ numérique. Brendle, Mark. (BrendleWhat). "Why is the City of Toronto taking bikes from @TedXToronto and throwing them into a furnace? #TedXToronto #BikeFurnace." 26 Oct. 2012, 12:49 p.m. Tweet. Campbell, W. Joseph. Getting It Wrong: Ten of the Greatest Misreported Stories in American Journalism. Berkeley: U of California P, 2010. Print. Coleman, B. Hello Avatar: Rise of the Networked Generation. Cambridge, MA: MIT P, 2011. Print. Cruz, Gilbert. "A Brief History of Orson Welles' War of the Worlds." TIME Entertainment. Time Inc., 30 Oct. 2008. Web. 29 Jan. 2014.
de Souza e Silva, Adriana. "From Cyber to Hybrid: Mobile Technologies as Interfaces of Public Spaces." Space and Culture 9.3 (Aug. 2006): 261-278. Web. 29 Jan. 2014. Flores, Leonardo. "'Occupy MLA' by Mark C. Marino and Rob Wittig." I Love E-Poetry. I Love E-Poetry, 27 Mar. 2013. Web. 29 Jan. 2014. Kolberg, Michael. "Best of 2012: The 8 Funniest Things that Happened in Toronto." Toronto Standard. Meshsquared Ventures, Inc., 28 Dec, 2012. Web. 29 Jan. 2014. Margolis, Jason. "Cyclists Accuse Toronto Mayor Ford of 'War on Bikes.'" BBC News Magazine. BBC, 2 May 2012. Web. 29 Jan. 2014. Marino, Mark C. and Rob Wittig. "Occupying MLA. ProfHacker. The Chronicle of Higher Education, 14 Jan. 2013. Web. 29 Jan. 2014. — . Occupy MLA. Mark Marino, 2013. Web. 29 Jan. 2014. — . "Netprov: Elements of an Emerging Form." Dichtung Digital 42 (Dec. 2012): n. pag. Web. 29 Jan. 2014. Muzychka, Jonathon. "Highlights from TEDxToronto 2012." blogTO. n.p., 27 Oct. 2012. Web. 29 Jan. 2014. Notopoulos, Katie. "TED Talk's Hashtags Get Trolled." BuzzFeed. BuzzFeed, Inc., 28 Oct. 2014. Web. 29 Jan. 2014. Pew Research Center. "Cell Internet Use 2013." Pew Internet & American Life Project, 16 Sept. 2013. Web. 29 Jan. 2014. Phillips, Andrea. "Hoax or Transmedia? The Ethics of Pervasive Fiction." South By Southwest. Austin Convention Center. Austin, TX. 13 Mar. 2011. Conference presentation. Audio recording. SXSW. SXSW, n.d. Web. 29 Jan. 2014. Sample, Mark (samplereality). Twitter feed. 25-29 Jan. 2013. Google Drive, 2013. Web. 29 Jan. 2014. Stenros, Jaako, Markus Montola, and Annika Waern. Pervasive Games: Theory and Design. Burlington, MA: Morgan Kaufmann, 2009. Print. TEDxToronto's biggest conference ever will perform intellectual Alchemy. TEDxToronto, 24 May 2012. Web. 29 Jan. 2014. Wittig, Rob. "Networked Improv Narrative (Netprov) and the Story of Grace, Wit & Charm." MA thesis. U of Bergen, 2011. Web. 29 Jan. 2014. — . "Pasts and Futures of Netprov." Electronic Literature Organization. West Virginia U. Morgantown, WV. 12 Jun. 2012. Conference presentation. Vimeo, n.d. Web. 29 Jan. 2014. The true scale of this hysteria has been debated in recent years. See Chapter 2 of W. Joseph Campbell's Getting It Wrong: Ten of the Greatest Misreported Stories in American Journalism. Sample's tweets from this time period have been archived publicly at «https://googledrive.com/host/0By7OircJ9labZktFR0xkT1ExUXc/#». 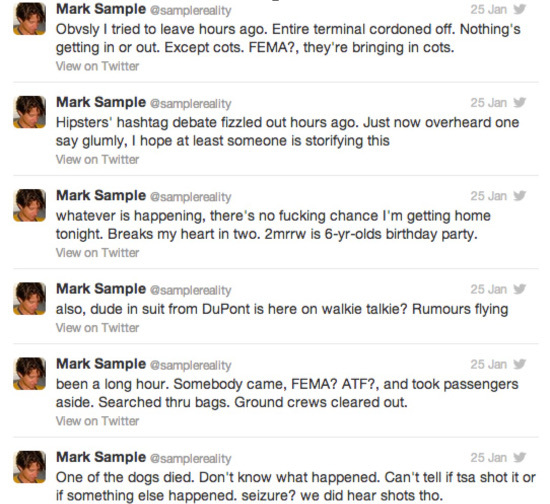 All tweets and other media associated with Occupy MLA have been archived at «http://markcmarino.com/omla/». See the discussion in the comment section of Marino and Wittig's ProfHacker article, "Occupying MLA." For a more detailed theoretical explanation of the Bonfire ARG, see Aardse et al. 's "Gaming with the Spectacle of Community" in The Bonfire of the Humanities, forthcoming in Digital Studies / Le champ numérique. 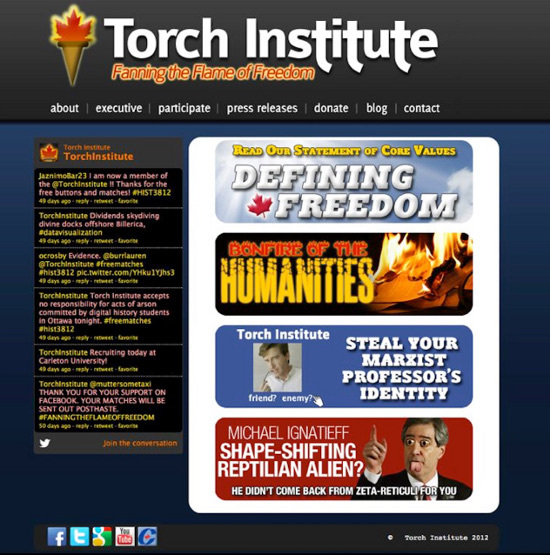 TorchInstitute.ca has since been removed from the Web, but all of the affiliated social media accounts remain active. Lauren Burr is a PhD candidate in the English Department at the University of Waterloo, studying and creating critical locative and pervasive media. Lauren's recent collaborative projects include Bonfire of the Humanities, an alternate reality game designed for Congress 2012; Cytopath, an augmented reality necromedia game set in downtown Kitchener; and House of Lexia, a locative hypertext remediation of Mark Danielewski's House of Leaves. She has a publication forthcoming in Digital Studies, and is a contributor to the online publication First Person Scholar. Lauren conducts her research with both the Critical Media Lab and The Games Institute at uWaterloo, and continues to collaborate as an adjunct researcher with the Carleton University Hypertext and Hypermedia Lab after completing an MA at Carleton in 2011. Lauren's work is funded by the Social Sciences and Humanities Research Council of Canada.